We requested dinner at 6 p.m. and a staff was waiting for us at the lobby when we arrived just a bit early. We enjoy our meal in the structure facing the garden just outside the lobby. The atmosphere inside is Japanese-modern. Meals are usually served in the restaurant, but there are plans with private rooms and guests can also specify their private rooms for an extra price. Private room with a table. Private room for large groups. We were shown to the private room over there on the other side because meals for those in special rooms are served in private rooms. A private room from where a garden can be seen. Staff members who serve meals are dressed in Japanese clothes, Kimono (着物). We first have with a cold beer after our bath. This is how Japanese people love to start off. 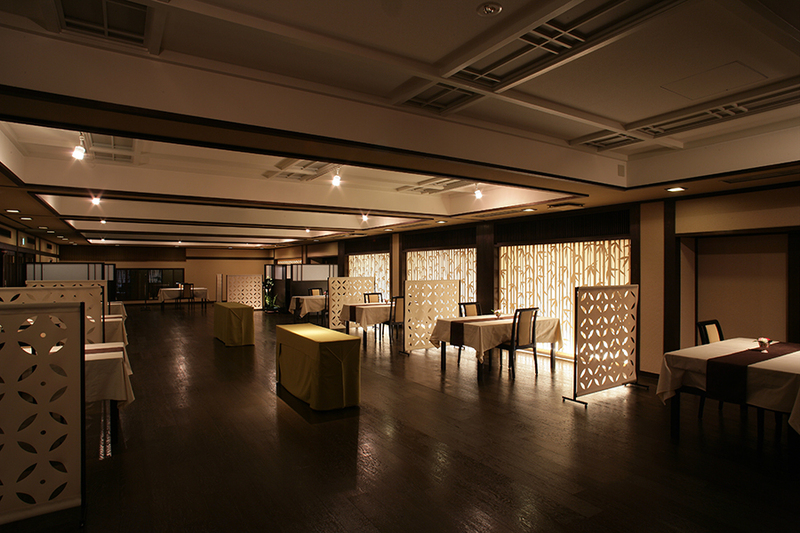 Biwako Hanakaido serves traditional Japanese dishes, Kaiseki (会席), one at a time in the order listed in the menu. 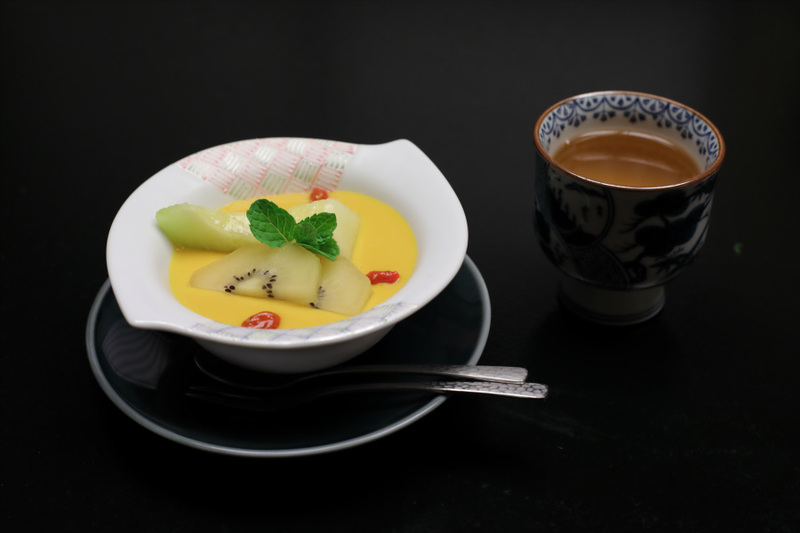 Guests can enjoy seasonal dishes because the menu changes each month. 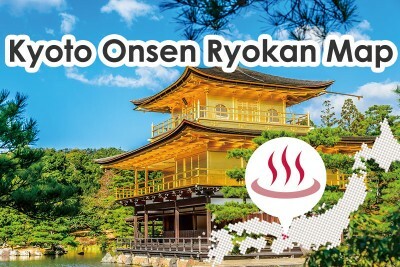 Meals that are different from those on the first day are served for guests staying multiple nights. They are delightful not only to the mouth, but to the eyes as well. The staff serves them one at a time. The sweetfish is broiled with salt right in front of you. The dishes are served in a timely manner. We ordered a local Sake (日本酒) because of its reputation. They let you choose which sake cup you would like to use. It was delicious chilled over ice. Next is Shabu-Shabu (しゃぶしゃぶ) made with local Ohmi Beef (近江牛). Ohmi Beef is also popular among Japanese people. Place the vegetables in the pot, and then the meat when it starts to boil. The meat changes color when stirred a few times. Dip it into your favorite among the two types of sauce before eating. 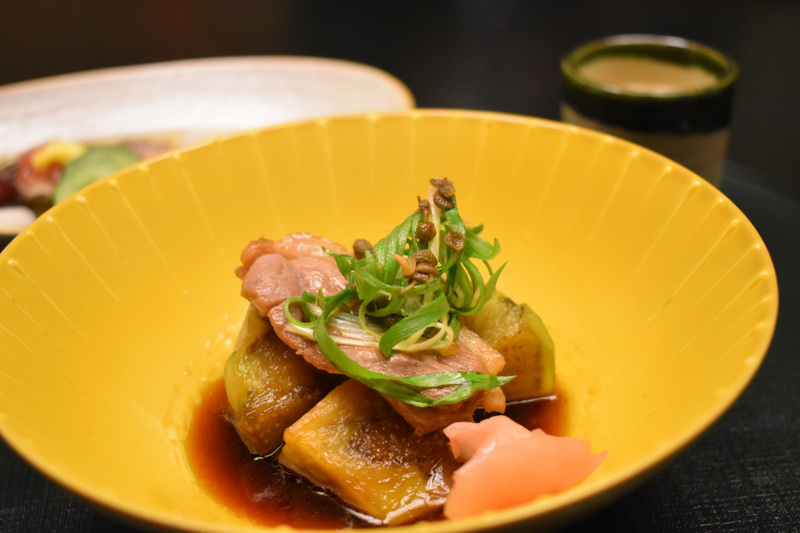 Japanese food is healthful and contains many vegetables. 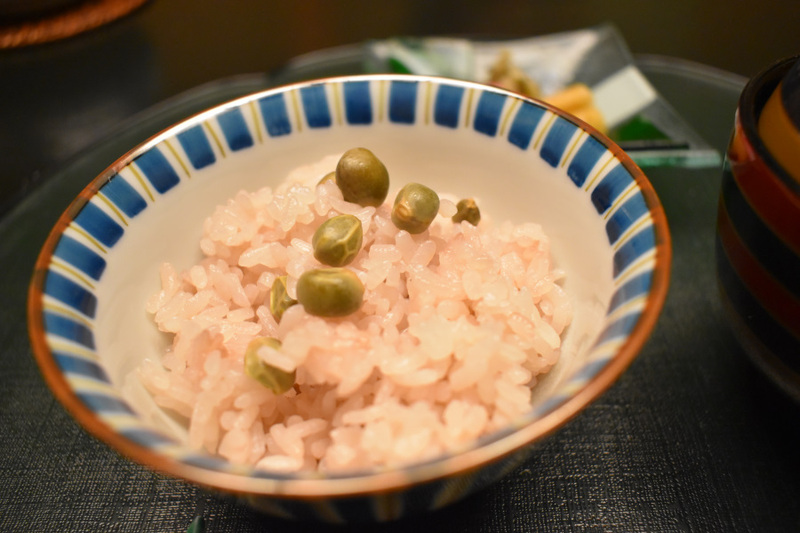 Rice boiled with beans, served with Miso soup (味噌汁). I was full because it was so delicious that I ate it all. The view of the garden outside after our meal was beautiful. The other guests on the premises are also wearing Yukatas (浴衣). 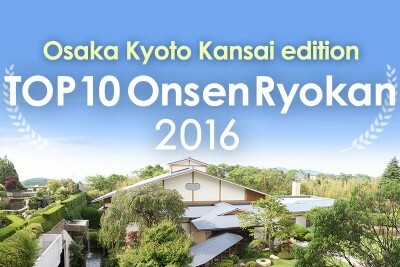 Guests at ryokans can easily relax without having to worry about dress codes because Yukatas are worn inside. There are also toys for children to play with. Returning to our room after slowly looking around. 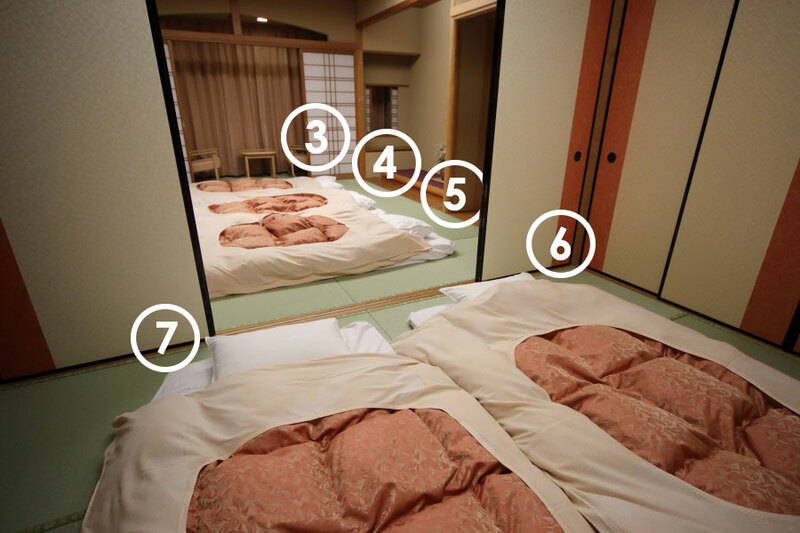 Futons (布団) were laid out for us in our room. 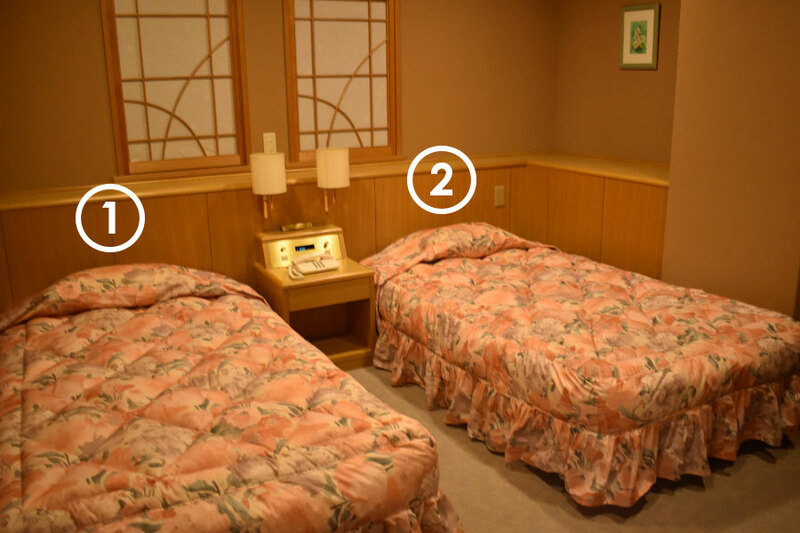 Futons are prepared during meals at ryokans so guests bring their valuables with them or keep them in a safe if there is one in the guestroom. 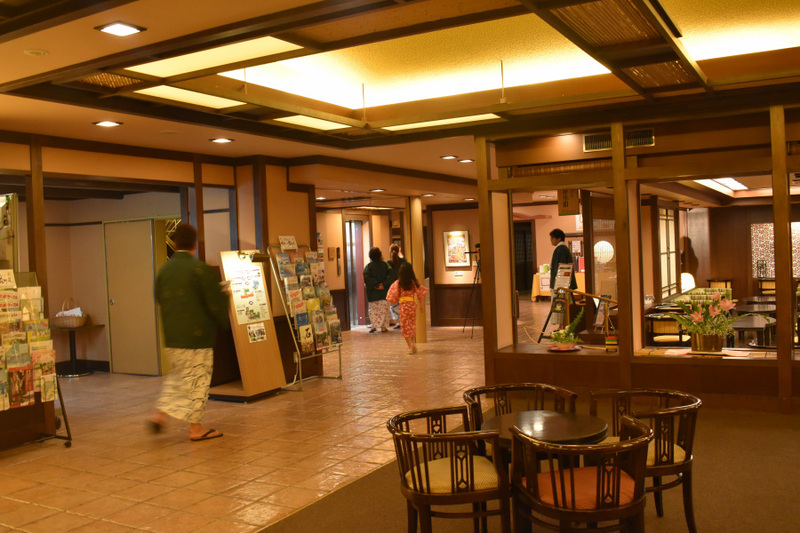 There are also many people who check them at the front desk in Japan. 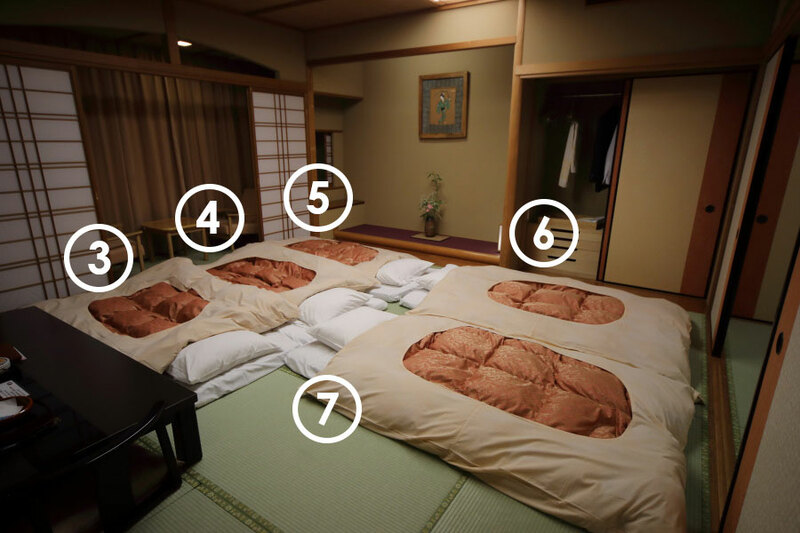 Up to seven guests at once can stay in special rooms. We took this opportunity to have them prepare for seven guests staying overnight. 2 guests in the bedroom. 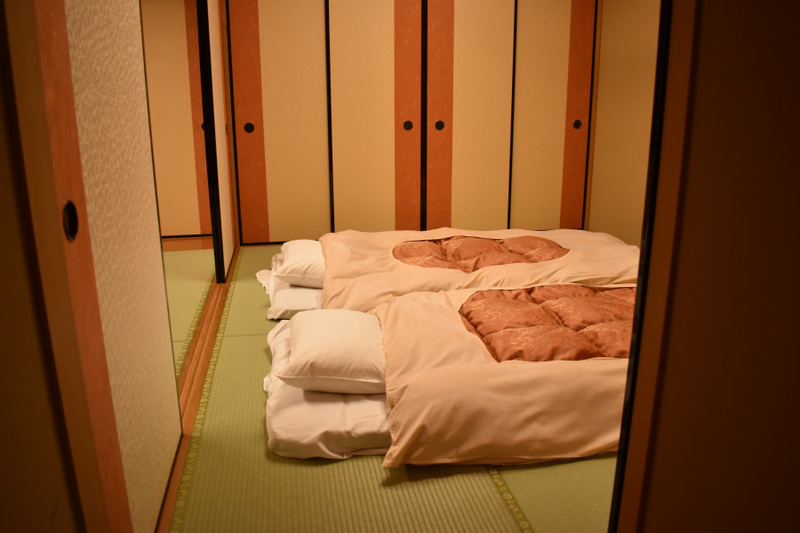 Members of families or groups all sleeping together in the same large room may be an experience you can find only in Japan. The night view of Lake Biwa outside is beautiful. 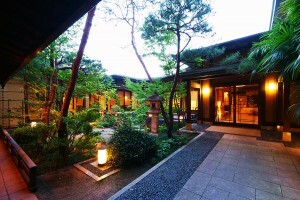 The night view from the open-air bath in the room is also beautiful. Slowly taking an open-air bath in the room while enjoying the night view is a truly relaxing experience. 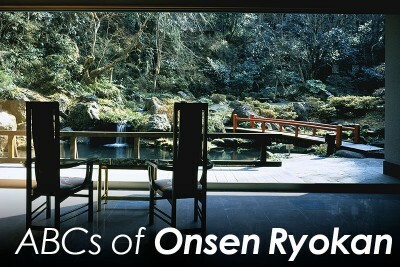 One great appeal is being able to enjoy a hot spring bath in private anytime you want without having to leave your room.